A very basic of field research is to see things with your own eyes, and to talk with people directly. By doing so, we can begin to understand the complexity and richness of one's day-to-day activities within the research site. Thereon, we can proceed to generate thick descriptions of the situation. Whereas we understand that it is important to get closer to the informants (interviewees), and to develop corporative relationships, it is sometimes difficult to initiate communication when it comes to face-to-face settings. Particularly, when we are trying to enter a local community for the first time as "strangers," we all tend to feel pressured. We get nervous. Even with a careful preparation in advance, we do not know what would happen during the "real" interview sessions. And we know from our experiences that many unanticipated things happen in real-life situations. However, as for the very first meeting with the informant (interviewee), we have to somehow manage to carry on. The more important is, we suggest, to reflect upon the situation in which we tried to cope with the pressure. Thus, we need to stretch our imagination in order to think about what we should do after the interview session. A "camp" is an attempt to incorporate additional contacts with the interviewees, immediately after the first session. 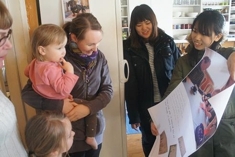 That is, we try to meet the interviewees again on the next day. We work overnight to create a set of "small media." 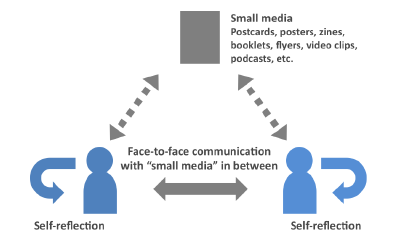 Here, the notion of "small media" refers to forms of presenting the results of interview sessions, such as postcards, , zines, flyers, booklets, podcasts, and video clips. They are relatively easy to create and deliver to the interviewees. A piece of "small media" transforms a dyad relationship into a triad relationship, for the second meeting, and thereby facilitates our conversations. It also alleviates the pressures associated with face-to-face communication that we encountered during the day before. By having a set of "small media" in-between, both the interviewer(s) and interviewee can reflect upon the session together. 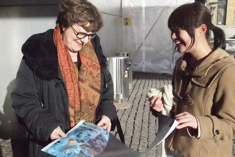 In our past project conducted in Helsinki (March, 2012), we created seven posters out of seven interview sessions. 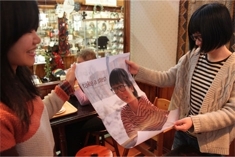 As shown in the photos below, we delivered the posters to each of the interviewees during our stay. There, a set of triad relationships was created. This phase of the project may further develop the relationship between the interviewer(s) and the interviewee, while promoting one's self-reflection. Our approach, a mode of "camp," proposes a framework to understand the roles of researchers, as outsiders, to stimulate and revitalize local community members in order to enrich their understandings and practices of community development. I suggest that the process of community development can be understood as a joint-construction realized by both insiders and outsiders. That is to say, outsiders can play an important role to reexamine and rediscover the various resources within the community, and thereby contribute to provide with ideas to the local community from the "outside in."